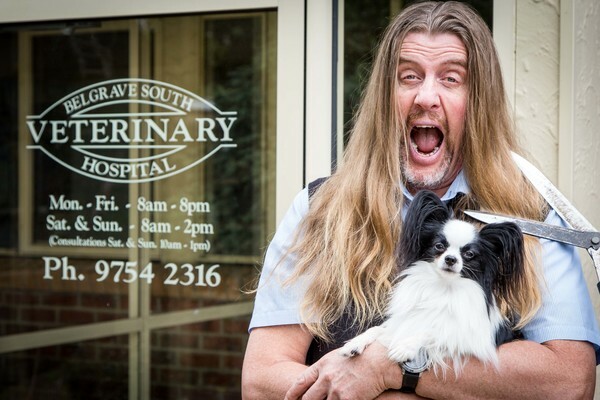 Belgrave South Veterinarian Dr. Peter Van Orsouw will be raising money for Vets Beyond Borders and cutting his hair to donate to people who have lost theirs through cancer or Alopecia. Dr. Peter Van Orsouw is getting the snip but, it’s not what you think. The Belgrave South Veterinary Clinic veterinarian is getting luscious long locks lopped off at the Australian Veterinary Association National Conference in Perth next month, to raise funds for Vets Beyond Borders (VBB). His hair will then also be donated to people who have lost theirs through cancer or Alopecia. Mr Van Orsouw said that for the past four years he has been growing a luxurious mane of hair with the primary view of raising funds for VBB. His fundraising goal is $5,000 and he kicked it off with a personal donation of $500. If he reaches that goal, he said he’ll go for the clean ‘No. 1 romper stomper look’, much to his wife’s chagrin. “As a vet you’re often very busy, and in September 2014 I was just struggling to get to the hair dresser and I thought ‘I’ve been having the same haircut for 40 years so perhaps it’s time for a change,’” he said. “So I let it grow a little bit. All of the funds raised will go towards Vets Beyond Borders, an international charity based in Australia that deploys volunteer veterinarians, veterinary nurses and other animal welfare workers across the globe to deliver animal health and community awareness programs where they are desperately needed. Dr Van Orsouw is a new member of VBB and eager to volunteer somewhere around the world. But first, he needs a haircut.